Discuss the use of moderate sedation in the dental setting, and various considerations for airway management. List possible adverse events and clinical responses associated with moderate sedation. Explain the role of emergency reversal drugs when using moderate sedation techniques. The need to mitigate concerns raised by the public, media and state dental boards has been a subject of much discussion among pediatric professionals.25,26 Thus, this article offers alternative emergency protocols for the management of airway compromises — such as sedation-induced airway obstruction, hypoventilation, apnea or laryngospasm — during pediatric moderate sedation without an established IV line. The following suggestions provide easily followed emergency protocols that should enable dentists to effectively manage adverse airway compromises. A secondary objective is to introduce the intranasal (IN) route for administration of emergency reversal drugs. 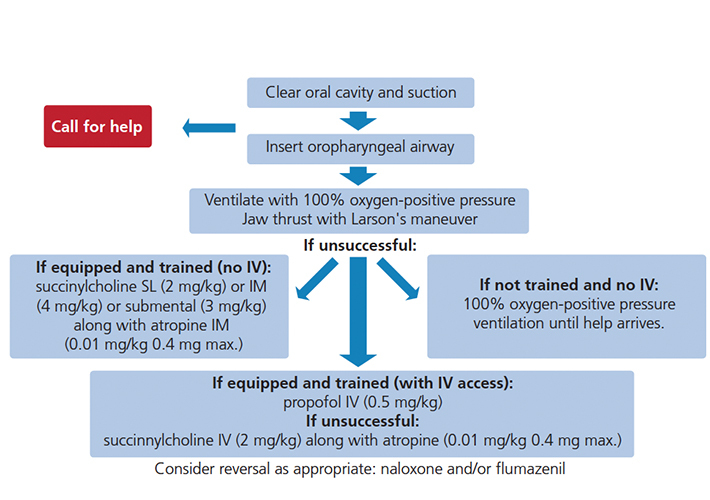 A proposed protocol for the management of hypoventilation, apnea and sedation-induced airway obstruction is presented in Figure 1. Timely recognition of developing hypoventilation or apnea is critical. To maximize the effectiveness of air exchange, the airway should be cleared while observing the presence of any foreign bodies (e.g., saliva, blood, vomitus or tooth fragments), checking airway flow and smell, and assessing respiratory efforts and depth of consciousness. When earlier suctioning of the oral cavity has not been performed, the risk of introducing foreign bodies into the airway is higher, which may increase hazards of aspiration, obstruction and laryngospasm. Concurrently, airway repositioning (via head tilt and/or chin lift, and, specifically, forward jaw thrust) may open the airway and inflict painful stimuli sufficient to prompt spontaneous breathing. Administration of 100% oxygen should be initiated. If nitrous oxide was administered earlier, the nitrous oxide nasal hood may be left on with 100% oxygen. In many circumstances, this exercise renders both isolation system removal and bag-valve mask ventilation unnecessary. Moreover, auditory sensation is one of the last senses to be lost when slipping into deeper levels of sedation;27–29 thus, calling the patient by name with breathing reminders should accompany painful stimulation, such as a trapezius pinch or sternal rub. If jaw thrust is not successful in establishing spontaneous ventilation within five to 10 seconds, the isolation system should be removed and bag-valve mask ventilation commenced. Considering that occasional hypoventilation and airway obstruction following a moderate sedation schedule is generally mild, the patient may not be deeply unconscious and a nasopharyngeal airway may be better tolerated. Placement of an oral airway in a semiconscious child might induce unwanted reactions (e.g., gagging, vomiting or laryngospasm). Another advantage of a nasopharyngeal airway is that it can be instituted prior to removal of any oral isolation system, which is impossible with an oral airway. FIGURE 1. Treatment of hypoventilation and apnea. If unsuccessful, a more profound depression of consciousness, along with physical pharyngeal space obstruction by hypotonic tongue, may be suspected and an oral airway should be introduced. As long as appropriate ventilation, oxygenation and circulation are confirmed, the child may be “rescued” to a moderate level of sedation. It is the provider’s responsibility to determine if and when to seek additional assistance. However, when sufficient ventilation cannot be confirmed, an emergency medical service (EMS) that is experienced with children must be summoned without delay. While awaiting EMS support, insertion of a laryngeal mask airway or similar device may be considered. FIGURE 2. Treatment of laryngeal spasm. The proposed alternative protocol for the management of laryngospasm is presented in Figure 2, and begins with calling for help. 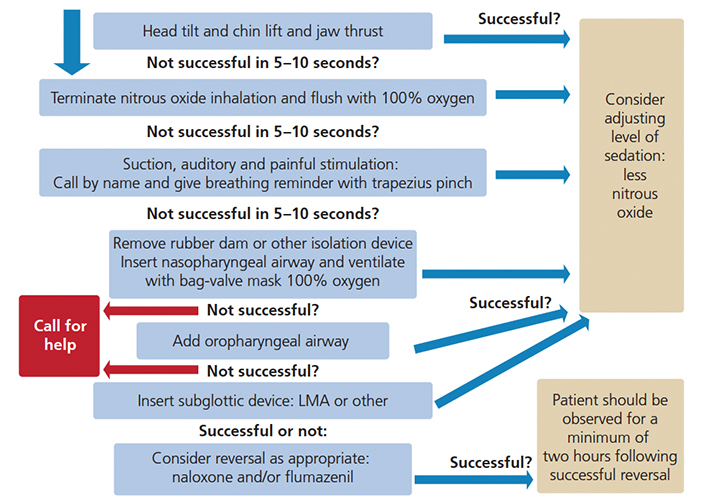 Simultaneously, airway repositioning and suctioning is performed. Neglecting this step may not only introduce foreign bodies into the airway but, due to the continued irritation of the superior laryngeal nerve, might be the very cause of the spasm in the first place. Early insertion of an oral airway can facilitate intraoral access in case of masticatory spasm. Next, application of pressure behind the ears (Larson’s maneuver) and administration of 100% oxygen with positive pressure should be attempted.32 The dentist may designate trained personnel to start intravenous access while securing airway competency, or assign another staff member to ventilate the patient while he or she tries to obtain intravenous cannulation. 2. If equipped and trained, but with no IV access: While continuing positive pressure ventilation, succinylcholine may be administered via sublingual (SL) injection (2 mg/kg), IM injection (4 mg/kg) or submental injection (3 mg/kg), along with (optional) atropine IM (0.01 mg/kg 0.4 mg maximum). 3. If not equipped and without IV access: Continue attempting positive pressure ventilation until help arrives. When oxygen saturation drops, spontaneous relaxation of laryngospasm may occur. Cases that involve complete laryngospasm should be evaluated for postoperative management and supervision due to possible complications, especially if muscle relaxants were administered. Hypoventilation is defined as decrease in minute ventilation, which is equal to tidal volume multiplied by respiratory rate. Hypoventilation provoked by sedation may be related to peripheral obstruction, central depression of the ventilatory drive, or mixed effect. Apnea is characterized by cessation of respiratory airflow for longer than 20 seconds, or shorter if associated with bradycardia or cyanosis.34 Morbidity in outpatient sedation may involve reduced muscle tone and/or central respiratory depression; this is frequently associated with airway obstruction and diminished diaphragmatic and intercostal muscle activity. Ventilation that is less than needed for CO2 elimination, and is inadequate to maintain normal PaCO2, could result in hypercarbia, respiratory acidosis, cardiac dysrhythmias, bradycardia and asystole. Laryngospasm is an involuntary spasm of the laryngeal musculature that occurs through sensory stimulation of the superior laryngeal nerve and afferent responses from the recurrent laryngeal nerve. It occurs especially in light plans of anesthesia. Lack of cortical inhibition of glottic reflexes may be a cause, along with direct and indirect stimulatory insults. Abrupt induction of inhaled anesthetics, insertion of oral/nasal airways, laryngoscopy, secretions, vomitus, blood, coughing, bronchospasm, frequent suctioning, difficult airway management, and removal of endotracheal tubes.46,47 may induce laryngospasm. Prevention and timely recognition of developing laryngospasm are key goals. Consciousness is the best way to prevent laryngospasm, followed by prevention of direct and indirect stimuli. In partial laryngospasm, a high-pitched crowing sound, a small amount of ventilation, and bag movement are evident, while in complete laryngospasm neither sound nor bag movement are noticeable. Either partial or complete laryngospasm are presented with paradoxical movement of the chest and abdomen, supraclavicular, suprasternal, intercostal, subcostal retractions, and tracheal tag with indrawing of the chest wall. Decreased or absent EtCO2 wave form is common. While administration of propofol is the most suitable management by an anesthesiology team with available IV access, this might not be feasible for a general or pediatric dentist in a moderate oral sedation setup with no IV in place. Furthermore, most state dental boards would limit the use of propofol to dentists with deep sedation or general anesthesia permits. Administration of propofol and succinylcholine potentially require prolonged ventilation, carry inherent risk (e.g., overventilation, arrhythmias or malignant hyperthermia), additional cost of stocking dantrolene sodium, and training that is beyond the scope of dentists practicing enteral moderate sedation. It can be argued that management of severe laryngospasm by alternative means to IV medication should be further explored. Wilson S, Houpt M. Project USAP 2010: use of sedative agents in pediatric dentistry-a 25 – year follow-up survey. Pediatr Dent. 2016;38:127–133. Murphy MG, Fields HW Jr, Machen JB. Parental acceptance of pediatric dentistry behavior management techniques. Pediatr Dent. 1984;6:193–198. Eaton JJ, McTigue DJ, Fields HW Jr, Beck M. Attitudes of contemporary parents toward behavior management techniques used in pediatric dentistry. Pediatr Dent. 2005;27:107–113. Fields HW Jr, Machen JB, Murphy MG. Acceptability of various behavior management technique relative to types of dental treatment. Pediatr Dent. 1984;6:199–203. Lawrence SM, McTigue DJ, Wilson S, Odom JG, Waggoner WF, Fields HW Jr. Parental attitudes toward behavior management techniques used in pediatric dentistry. Pediatr Dent. 1991;13:151–155. White J, Wells M, Arheart LK, Donaldson M, Woods MA. A questionnaire of parental perceptions of conscious sedation in pediatric dentistry. Pediatr Dent. 2016;38:116–121. Shephered AR, Ali H. A care pathway for children unable to accept dental care within the general dental services involving the use of inhalation sedation and general anesthesia. Prim Dent J. 2015;4:29–34. Sun LS, Li G, Miller TL, Salorio C, Byrne MW, Bellinger DC et al. Association between a single General anesthesia exposure before age 36 months and neurocognitive outcomes in later childhood. JAMA. 2016;315:2312–2320. Olsen EA, Brambrink AM. Anesthesia for the young child undergoing ambulatory procedures: current concerns regarding harm to the developing brain. Curr Opin Anaesthesiol. 2013;26:677–684. Whyman RA. Dental care for children under general anesthesia by private dental practioners in New Zealand. N Z Dent J. 2000;96:14–17. Ashley PF, Williams CE, Moles DR, Parry J. Sedation versus general anesthesia for provision of dental treatment to patients younger than 18 years. Cochrane Database Syst Rev. 2015;28:CD006334. Avalon S, Gozal Y, Kaufman E. The use of conscious sedation versus general anesthesia in modern dentistry: rising ethical dilemas. Refuat Hapeh Vehashinayim. 2004;21:19–26, 93–94. Lee JY, Vann WF Jr, Roberts MW. A cost analysis of treating pediatric dental patients using general anesthesia versus conscious sedation. Anesth Prog. 2001;48:82–88. Muthukrishnan A, McGregor J, Thompson S. Safety and predictability of conscious sedation in dentistry – a multi-centre regional audit: South and West Wales experience. Br Dent J. 2013;215:E13. Lee HH, Milgrom P, Starks H, Burke W. Trends in death associated with pediatric dental sedation and general anesthesia. Paediatr Anaesth. 2013;23:741–746. Coté CJ, Karl HW, Notterman DA, Weinberg JA, McCloskey C. Adverse sedation events in pediatrics: analysis of medications used for sedation. Pediatrics. 2000;106:633–644. Krippaehne JA, Montgomery MT. Morbidity and mortality from pharmacosedation and general anesthesia in the dental office. J Oral Maxillofac Surg. 1992;50:691–698; discussion 698–699. Jastak JT, Peskin RM. Major morbidity or mortality from office anesthetic procedures: a closed-claim analysis of 13 cases. Anesth Prog. 1991;38:39–44. Goodson JM, Moore PA. Life-threatening reactions after pedodontic sedation: an assessment of narcotic, local anesthetic, and antiemetic drug interaction. J Am Dent Assoc. 1983;107:239–245. Cote CJ, Wilson S. American Academy of Pediatrics, American Academy of Pediatric Dentistry. Guidelines for monitoring and management of pediatric patients before during and after sedation for diagnostic and therapeutic procedures: update 2016. Pediatrics. 2016;138:e20161212. Litman RS, Kottra JA, Berkowitz RJ, Ward DS. Upper airway obstruction during midazolam/ nitrous oxide sedation in children with enlarged tonsils. Pediatr Dent. 1998;20:318–320. Litman RS, Kottra JA, Verga KA, Berkowitz RJ, Ward DS. Chloral hydrate sedation: the additive sedative and respiratory depressant effects of nitrous oxide. Anesth Analg. 1998;86:724–728. Litman RS, Kottra JA, Berkowitz RJ, Ward DS. Breathing patterns and level of consciousness in children during administration of nitrous oxide after oral midazolam premedication. J Oral Maxillofac Surg. 1997;55:1372–1377. Litman RS, Berkowitz RJ, Ward DS. Levels of consciousness and ventilator parameters in young children during sedation with oral Mmdazolam and nitrous oxide. Arch Pediatr Adolesc Med. 1996;150:671–675. Thikkurissy S. Standing at the confluence. Pediatr Dent. 2016;38:98–99. Seale NS. AAPD Clinical Practice Guidelines–why they are more important than ever. Pediatr Dent. 2013;35:404–405. Tian SY, Zou L, Quan X, Zhang Y, Xue FS, Ye TH. Effect of midazolam on memory: a study of process dissociation procedure and functional magnetic resonance imaging. Anaesthesia. 2010;65:586–594. von Delius S, Thies P, Rieder T, et al. Auditory evoked potentials compared with bispectral index for monitoring of midazolam and propofol sedation during colonoscopy. Am J Gastroenterol. 2009;104:318–25. Altman NR, Bernal B. Brain activation in sedated children: auditory and visual functional MR imaging. Radiology. 2001;221:56–63. Traynor K. FDA approves first intranasal naloxone product. Am J Health Syst Pharm. 2016;73:e2–3. Stanley FM: Textbook of Sedation a clinical guide to patient management. Chapter 25: Pharmacology. 2010, P.346, 460. Abelson D. Laryngospasm notch pressure (‘Larson’s maneuver’) may have a role in laryngospasm management in children: highlighting a so far unproven technique. Paediatr Anaesth. 2015;25:1175–1176. Sapir S, Zitterell C, Kane JD. Letter to the editor. Pediatr Dent. 2017;39:94–96. Nelson NM. Members of task force on prolonged apnea. Reports of the task force on prolonged apnea of the American Academy of Pediatrics. Pediatrics. 1978;61:651–652. Strang J, McDonald R, Alqurshi A, Royall P, Taylor D, Forbes B. Naloxone without the needle – systematic review of candidate routes for non-injectable naloxone for opioid overdose reversal. Drug Alcohol Depend. 2016;163:16–23. Krieter P, Chiang N, Gyaw S, et al. Pharmacokinetic properties and human use characteristics of an FDA-approved intranasal naloxone product for the treatment of opioid overdose. J Clin Pharmacol. 2016;56:1243–1253. Kerr D, Kelly AM, Dietze P, Jolley D, Barger B: Randomized controlled trial comparing the effectiveness and safety of intranasal and intramuscular naloxone for the treatment of suspected heroin overdose. Addiction. 2009;104:2067–2074. Merlin MA, Saybolt M, Kapitanyan R, et al. Intranasal naloxone delivery is an alternative to intravenous naloxone for opioid overdoses. Am J Emerg Med. 2010;28:296–303. Dwyer K, Walley AY, Langlois BK, et al. Opioid education and nasal naloxone rescue kits in the emergency department. West J Emerg Med. 2015;16:381–4. Beletsky L, Rich JD, Walley AY. Prevention of fatal opioid overdose. JAMA. 2012;308:1863–1864. Heard C, Creighton P, Lerman J. Intranasal flumazenil and naloxone to reverse over-sedation in a child undergoing dental restorations. Paediatr Anaesth. 2009;19:795–797; discussion 798–799. Zanette G, Favero L, Manani G, Facco E. Intranasal flumazenil and naloxone to reverse over-sedation in a child undergoing dental restorations: comment. Paediatr Anaesth. 2010;20:109. Corrigan M, Wilson SS, Hampton J. Safety and efficacy of intranasally administered medications in the emergency department and prehospital settings. Am J Health Syst Pharm. 2015;15;72:1544–1554. Heniff MS, Moore GP, Trout A, Cordell WH, Nelson DR. Comparison of routes of flumazenil administration to reverse midazolam-induced respiratory depression in a canine model. Acad Emerg Med. 1997;4:1115–1118. Scheepers LD, Montgomery CJ, Kinahan AM, Dunn GS, Bourne RA, McCormack JP. Plasma concentration of flumazenil following intranasal administration in children. Can J Anaesth. 2000;47:120–124. Roy WL, Lerman J. Laryngospasm in paediatric anaesthesia. Can J Anaesth. 1988;35:93–98. Hampson-Evans D, Morgan P, Farrar M. Pediatric laryngospasm. Paediatr Anaesth. 2008;18:303–307. From Decisions in Dentistry. June 2018;4(6):36–39. Shabtai Sapir, DMD, DMD, is an assistant professor and associate program director of the Advanced Education in Pediatric Dentistry Residency Program at Boston University’s Henry M. Goldman School of Dental Medicine. In addition, he serves as director of dental pediatric moderate sedation and as course director of the special health care needs and medically compromised management curriculum. Sapir is also the pediatric dental sedation attending at Franciscan Children’s Hospital in Brighton, Massachusetts. A diplomate of the American Board of Pediatric Dentistry, he can be reached at sapirdmd@bu.edu.